The den is equipped with satellite tv with built-in DVD & VCR & is stocked with lots of games for children & adults. There is also a small library of children's videos. 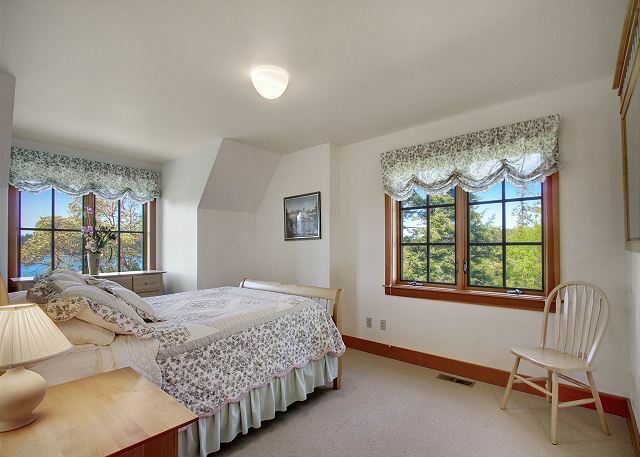 Junior master is also furnished with a queen sized bed and has its own adjoining bath. Westcott Bay Vista - WATERVIEW! HOT TUB! TENNIS COURT! 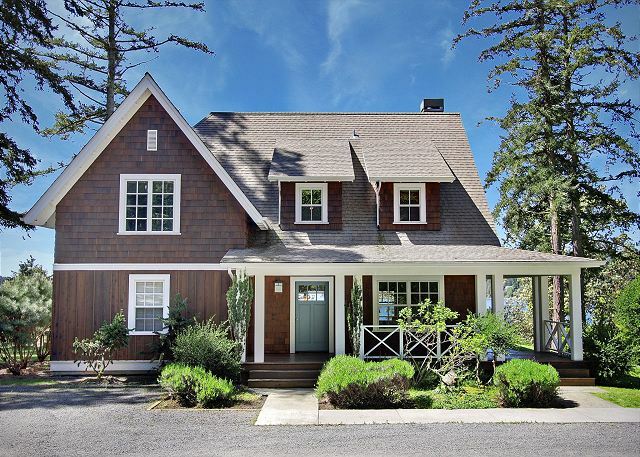 Westcott Bay Vista (formerly known as Bellevue Farm Cottage) is a beautiful Cape Cod style home constructed with great detail. This 2600+ square foot home is located atop a gentle hill, providing a spectacular view of Westcott Bay from almost every room. 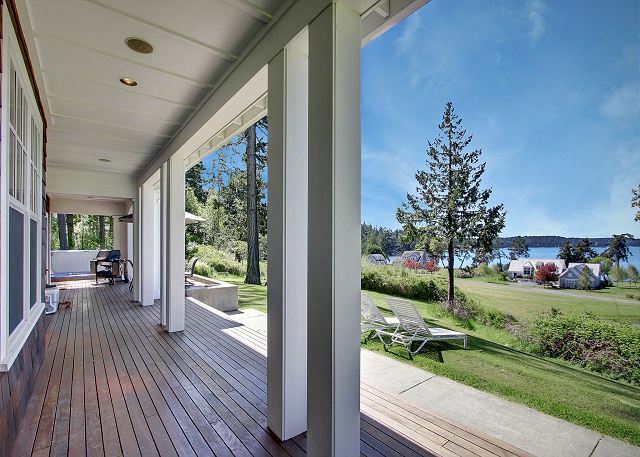 This exclusive community of similar style homes on spacious properties is a short mile walk into Roche Harbor Resort. 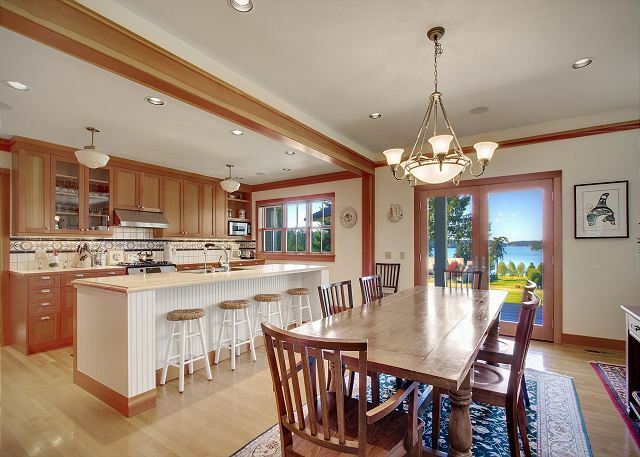 Enjoy the waterview setting from the living and dining rooms and kitchen of this beautiful island home. 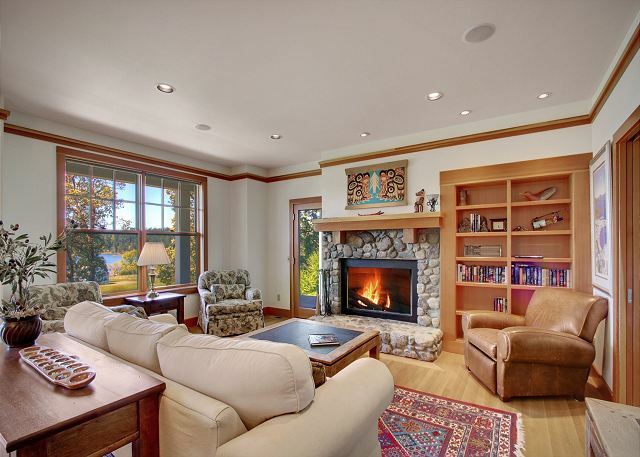 The comfortably furnished living room has a beautiful stone surround woodburing fireplace and in-home stereo system. 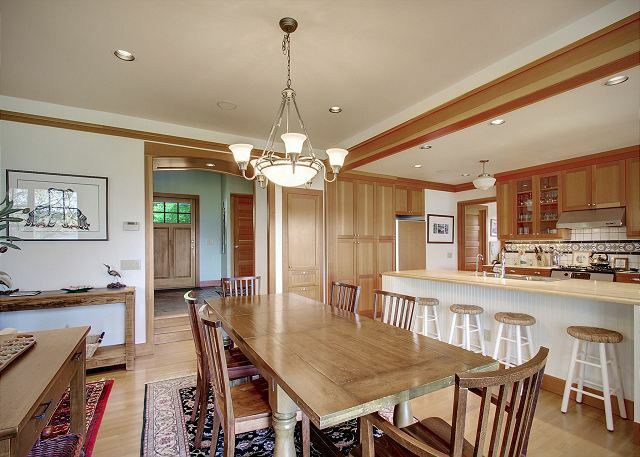 The dining table offers seating for 8 along with breakfast bar seating for 4. The kitchen if fully equipped. 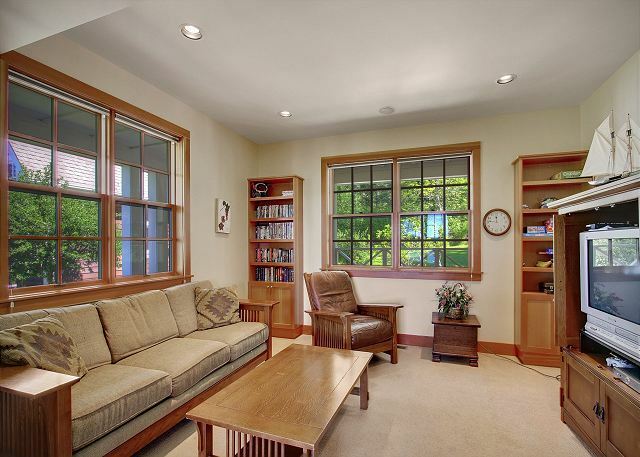 There is a private library/entertainment room that can be closed off with pocket doors for TV/DVD watching. Wireless internet connection available if you really must. Four bedrooms are located upstairs. The master suite is furnished with a queen size bed with waterviews and has an adjoining master bath with dual sinks and shower. The junior suite is also furnished with a queen size bed with waterviews and has and adjoining, private bathroom. 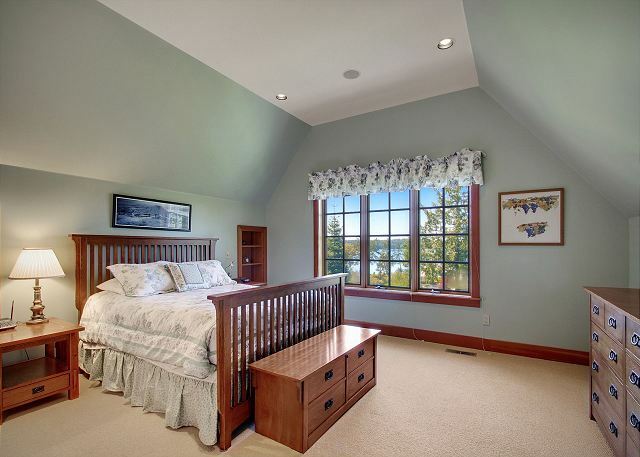 The third bedroom offers waterviews and is furnished with a queen size bed. 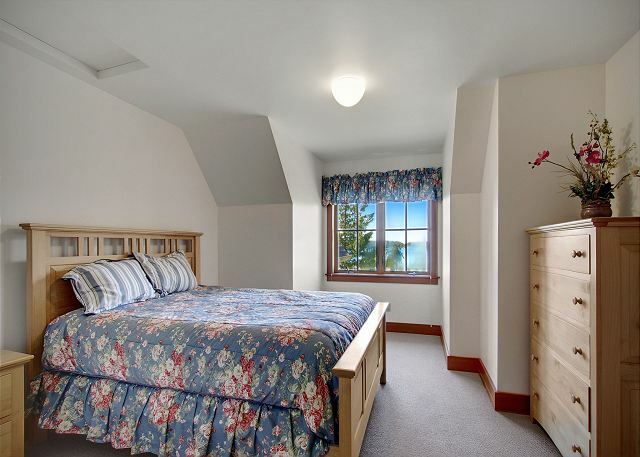 The fourth bedroom is furnished with 2 twin beds and 2 extra twin mattresses in the closet (4 twin beds total). Barbecue outside and enjoy the true southwest exposure maximizing all day sunlight. 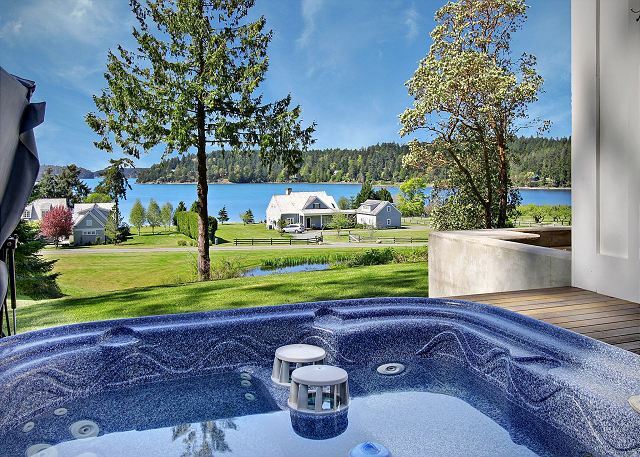 Watch the eagles, herons, otters, and deer - and enjoy the large grassy yard, hot tub, and large wrap around deck. 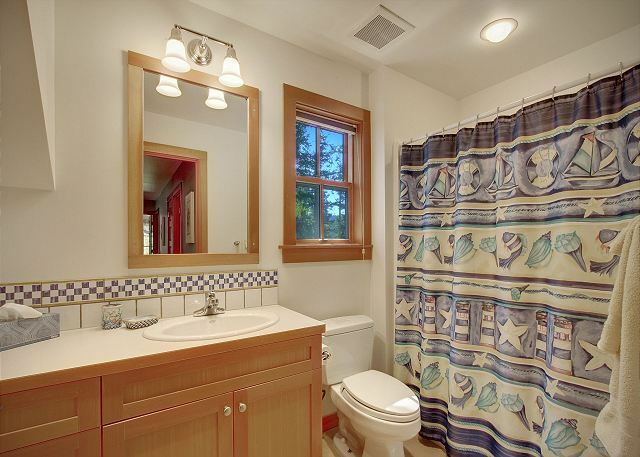 All this privacy yet just a short mile to Roche Harbor Resort with all of its amenities. Our rental experience was flawless. I received prompt information from San Juan Property Management prior to our arrival, and they called on our arrival date to make sure all was well. The house was perfect, the setting was amazing, and we thoroughly enjoyed the tennis court. The additional fees for the rental were steep so be prepared for those. A fantastic rental-the photos of the property are accurate, the view really is that good. The main floor is nice and open-perfect for hanging out. The dining table easily fit our group of 7, the kitchen was well appointed. The t.v. room off the main floor is nice to have plus a bathroom on the 1st floor. The kids loved the bunk beds and I loved that the bedrooms were upstairs so grownups could stay up chatting. Two bedrooms are en suites and there is an additional bathroom with tub/shower. Location was great-near Roche Harbor. Property Managers were organized with clear instructions and maps to make checking into the house nice and easy. Honestly - can't go wrong! We rented this home for two families for a week and it fit our needs perfectly. There were 9 people in our group and there was plenty of space for everyone. The kitchen is large, with a large dining table that makes it easy to prepare dinners at the house, if you'd rather do that then go out each evening. We stayed for five nights and prepared three dinners at the house and went out for two. 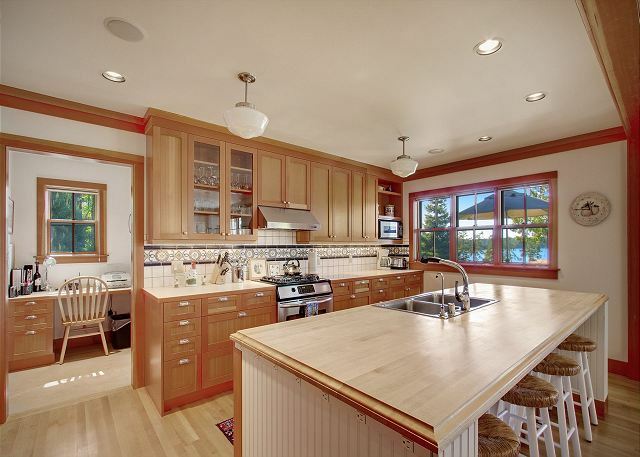 The location on the island is our favorite aspect of this house. 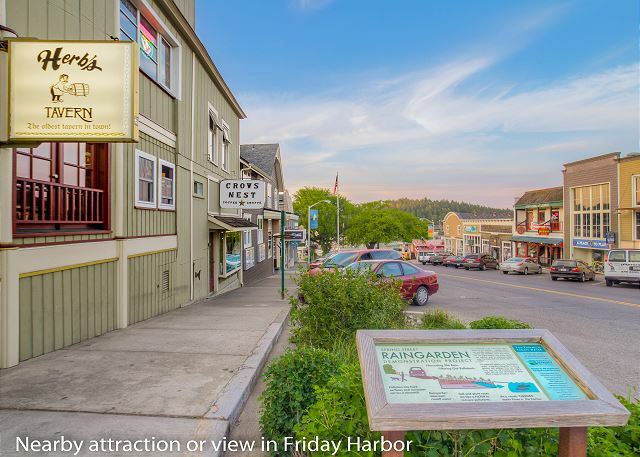 It is very close to Roche Harbor, which is quieter and more quaint than Friday Harbor. It is very close to the Westcott Bay Oyster Farm. There are several hiking trails nearby, including the Roche Harbor trails and the trails around English Camp. The only thing that was a bit below expectations was the color of the water in the hot tub. It was slightly green. The management company said this was usual and wasn't harmful. It didn't stop the kids from getting in and the hot tub functioned well other than the slight discoloration. All in all, it is an excellent vacation home. It was our second time here and we enjoyed it both times. This was a 'come back' experience. House was everything as advertised, with no disappointments. Good condition, well organized and clean. We had two homes rented in this neighborhood for large family gathering. This one was perfect, with even lots of blackberries to pick for pies and munchies. We will definitely visit this property again. This vacation rental exceeded our expectations. Layout was a perfect fit for our family. Kitchen was well equipped and outdoor grill amazing. Location was very good. 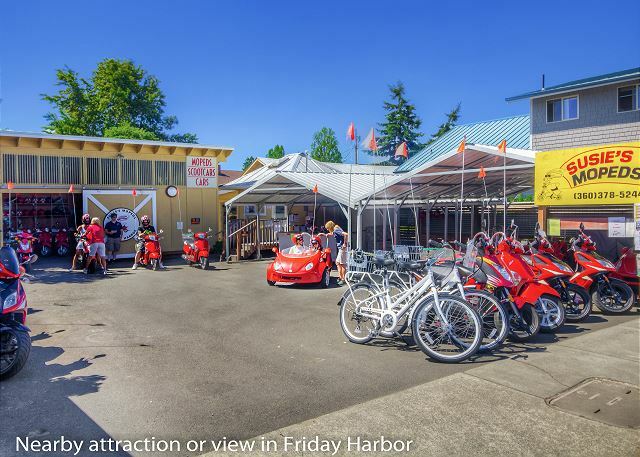 We spent time in Roche Harbor and also Friday Harbor and all spots in between. Did Sea kayaking, biking, parks, alpacas, lavender,and oyster tasting. Would definitely recommend to all. Our first vacation rental house. Overall the house was in a great location. Bathrooms and kitchen very Well equipped. I found the stove to be too small to cook for a large group but the grill had an extra burner. Would use this management company again. We spent a long weekend on San Juan Island and this was an ideal location to relax. We really enjoyed playing tennis on the nearby court and watching the sunset on the covered porch overlooking the bay. Just as advertised, nice house, spectacular views, great location! Even in the beautiful San Juan's modern TV should be part of a rental property of this caliber. The cost to upgrade to HD Directv is somewhere between free and minimal. Please make the upgrade! Great place with a Great view. A group of us came to Seattle and then to the San Juan islands for 2 short days. It was Amazing and the house was so warm and inviting . We arrived at the house around 4:30 and had a great sunset toasting wine on the deck of the house. The house was Clem and the beds comfortable . Was so nice to have so many rooms and bathrooms with the adult group we had. Enjoyed the music selection as it was from my era. Just loved the place and want to return for a longer time . Beautiful, well-equipped home that was a wonderful place for two families (with four children) to enjoy for a weekend. Kitchen was well-stocked with equipment, lots of games and movies for the kids, and hot tub was a big hit as well. Great layout for multiple families. Thank you! This was a great house for a family vacation to the San Juans! The view was incredible and the deck was a great place for sipping coffee in the morning and wine in the evening! The house was so clean and comfortable and the kitchen was VERY well equipped. The property management company was so easy to work with- from start to finish. 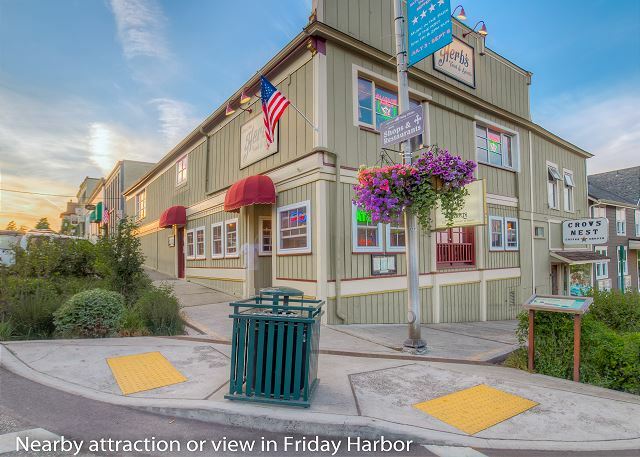 Within walking distance to Roche Harbor and a short drive to Friday Harbor, there was always something to do when you weren't spending time relaxing in such a lovely place. We will be back! Fantastic House well equipped with wonderful view! Westcott Vista is a fantastic house for a large family. We had 8 adults and 2 children from Bellevue, Washington DC and Berlin, Germany. Plenty of room to spread out. Kitchen well equipped and space for others to help cook and clean up. Hot tub and great extra treat. Bunk bed railings should be tighten up. View was excellent. We took advantage of horseback riding, kayaking, hiking, fresh seafood to cook. Drove to English and American camps. 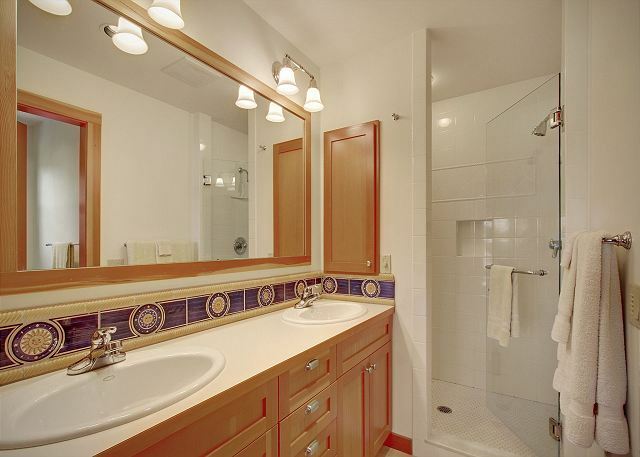 The property was clean, attractively decorated, well-equipped and comfortable. It was large enough to accommodate our 10 member family. The nearby tennis courts were an added bonus and we appreciated that the house had rackets and balls that we could use. The hot tub was also great to have. We would definitely return! Our family of 6 adults stayed here for several days. The views are beyond gorgeous from the home! The house itself is very spacious and accommodating, while the kitchen has absolutely everything you need to prepare meals. There are wild berries on the property available for picking. Chris (from the property management company) was very helpful and kind. This house was perfect and truly the pictures do not do it justice. Plenty of space and the house had everything you could need for a great weekend getaway. We stayed there to celebrate my husband's birthday with a group of friends. No complaints about the house and the property management was awesome. I got an e-mail right away from the management team to check on us and make sure we didn't need anything. The hot tub was a perfect way to relax on a cool and rainy day. Perfect! 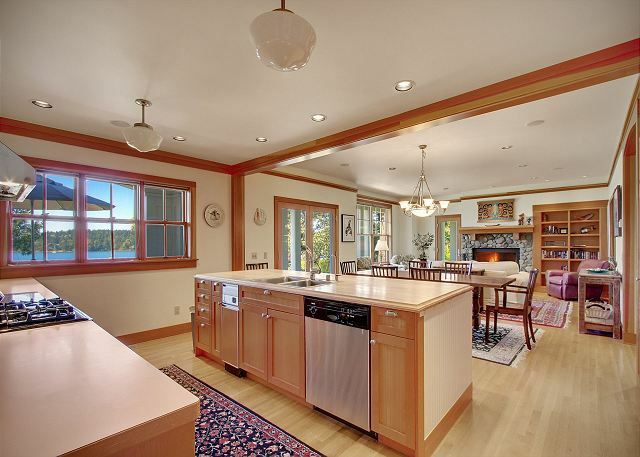 Lovely well appointed home in Wescott Bay near Roche Harbor. House was lovely, kitchen had almost everything we needed. Hot tub had a little too much chlorine, but was a delight to relax in as well. The picturesque view & crackling fire was perfect for our family Christmas celebration! The kitchen was outfitted with all the essentials. Better than we could have hoped! We visited this past weekend with 6 women for a Bachelorette party (Nov 14-16). Everything was perfect. What we loved was the space in the house to allow us all to sit around the fire, eat dinner at the table, fit in the hot tub, sleep comfortably, listen to our music throughout the house, even outside, etc. The house is beautiful and clean, the kitchen extremely well stocked with everything that a large group or family would need to make their stay great. I booked a private chef who visited from Orcas on Saturday night and she had everything she needed to create the perfect meal for us. Gorgeous location! Chris started the hot tub and delivered firewood before we arrived. We would not have changed anything about the visit except maybe a bit more info about where the lock box is located esp if you show up when it is dark. We will be back. We rented the house for a large group and were very pleased with the rental. It was ideal for several people with plenty of room for sleeping and socializing. The kitchen and rest of the house was equipped with everything we needed. The view was excellent and the location very convenient to both Roche Harbour and Friday Harbour. Great location, amazing views and comfortable house to relax in. We would definitely stay here again! We had an incredible time staying at this house. 35th reunion of 5 architectural college buddies who have been getting together every 5 years since 1984. I came here with 8 friends for a stagette weekend and we had the most amazing time. The house is GORGEOUS! 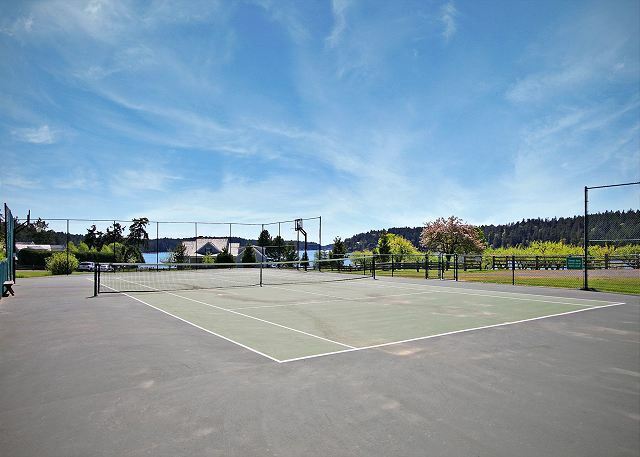 On a wonderful piece of property, very private, gorgeous view, so close to the tennis courts. The house was so spacious and had every kitchen amenity you could hope for. Oh and this island is just the cutest. Friday Harbour is too cute and we spent a day at Roche Harbour too; great for weddings! It was also such a pleasure dealing with San Juan Property Management; they were so professional and truly caring about our wants and needs. If I could move in here I would! This is our second time renting this house and we had an amazing Memorial Day weekend. Great location, plenty of room for everyone. Planning on returning next year. Thoroughly enjoyed all the appointments of this fine property down to the detailed labeling of the cabinets and drawers. Will definitely recommend to friends and will return. Stayed for a week during the holidays. House was as advertised. The house was clean, the beds comfortable and the furnishings were very nice. We absolutely loved our stay. The home was beautiful, great attention to detail. There were towels provided for the hottub, and plenty of firewood. Wonderful view too! Loved every bit of this rental house. 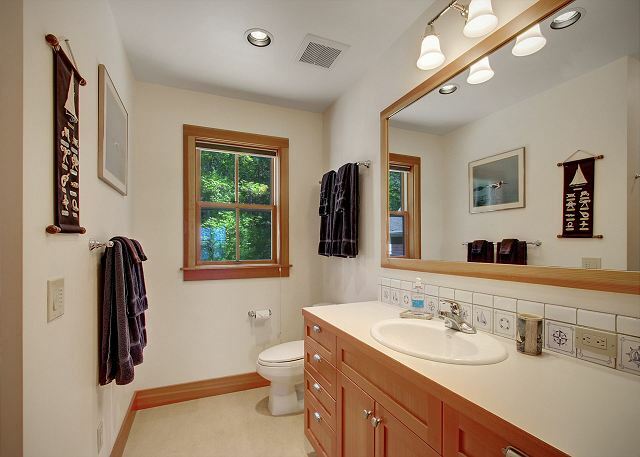 Clean, roomy, and location is great. My only complaint is that we didn't stay long enough. Will definitely book again for a LOT longer to enjoy this gem. Had a great family vacation and were so pleased with the house we stayed in. 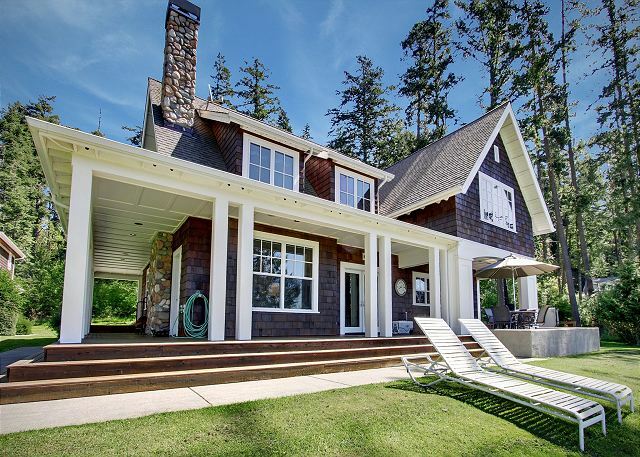 Would highly recommend to anyone looking for quality, cozy space for families to enjoy the San Juan Islands! We had a fabulous week in Bellevue Farm Cottage. The house was in pristine condition and decorated nicely. The water view from house, deck and hot tub was great. The property management people were wonderful to work with from leasing through our whole stay.They went above and beyond my experiences in other places. 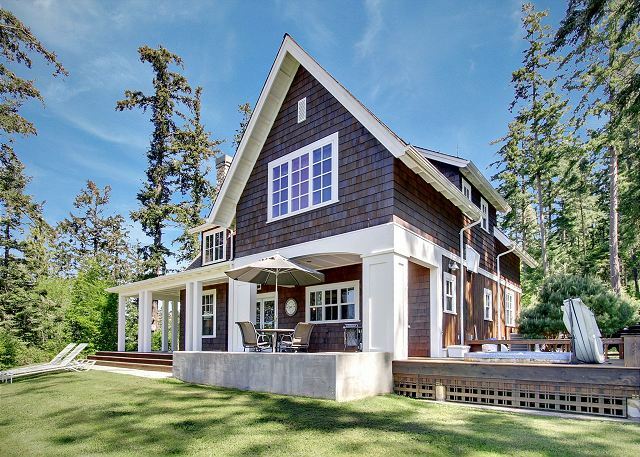 This is a beautiful home in a wonderful location. Our whole family of 3 generations enjoyed all the natural beauty of the San Juan Islands, whale watching, bald eagles nesting near by and the daily visit of the lame coyote. I would recommended this property to anyone looking for a relaxing vacation with spectacular scenery. House worked out very well for our group of 9. House was very clean and the beds were very comfortable. Kitchen was well stocked and we had plenty of towels and beach towels. The open floor plan is optimal for spending time together. Kitchen was large enough for 6 of us cooking all at once and we used the bbq several times. It was nice that some tennis rackets and balls were supplied, as well as, a baseball bat and bandmitten equipment. Location was great. Only a mile to Roche Harbor and about 8 to Friday Harbor. During our stay we enjoyed biking, hiking, kayaking, zip lining, and lots of time at the house. The best part of all though was the great view of the bay and all the bald eagles in the area. it was a wonderful house in a wonderful location and we had a wonderful time. The only things that could be improved - bunkbeds were both quite wobbly and need tightening up, and the hot tub seemed to be too chemivally smelling.. but it was a great place and we would definately stay again. We would highly recommend this house for anyone. The layout of the house is perfect, looks out over Westcott bay, close to Roche, hiking trails, the San Juan Winery and much more. We thoroughly enjoyed our stay and will go back next year.